Fall calls for a warm-weather escape — Thailand, Hawaii, or Canary Islands are the perfect beachy retreats. These accessories, made for the legendary, sun-seeking creatures, provide the essentials you need for that extraordinary vacation ... mermaid style. 1. Zoya Charla Nail Polish, $10 — Beat the blues with this sparkle aqua shade. 2. Manic Panic Amplified Pink Semi-Permanent Hair Color, $19 — The return of the pink hair is back and there’s no better time to flaunt a carefree do. 3. Pastease Sheshell Pasties, $11 — A functional sassy extra or a next-level mermaid shell top. 4. Ocean Lizard Wood Sunglasses, $69 — Playful frames that add a pop of funk . 5. 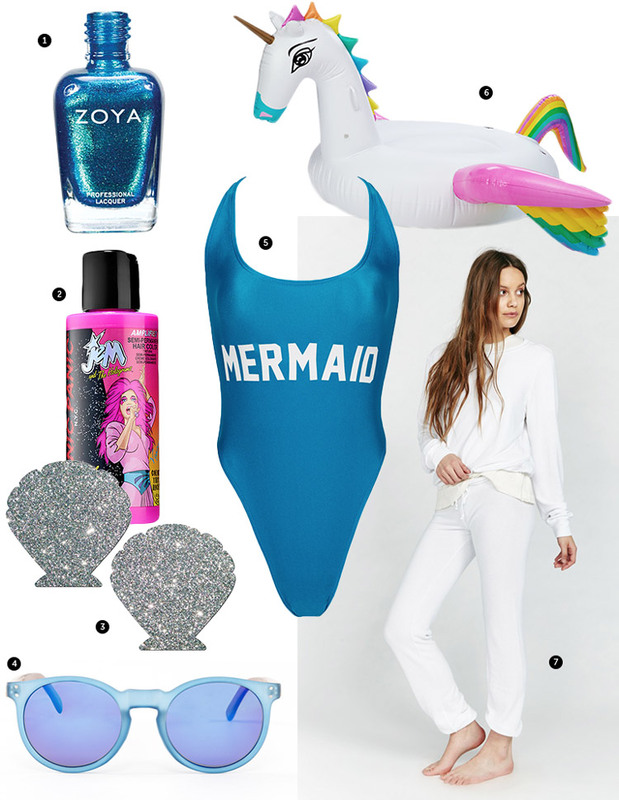 Private Party Mermaid One-piece, $100 — In case they didn’t know you’re a real-life sea creature — here’s the legit suit. 6. Funny Rainbow Unicorn Float, $99 — A vibrant floatie — because what else would a spunky magical legend float on? 7. Wildfox Malibu Skinny Sweats, $78 — Alright let’s face it you may need pants for boardwalk strolls.